THE HOME FOR THE LEADERS OF GEORGIA. GASC Membership Drive is here! We are excited to announce that GASC, the Georgia Association of Student Councils, has begun its annual Membership Drive. We have so many great things in store for you this year and we can't wait to share them with you. Our goal this year is for 40 schools to join or renew their membership with GASC by April 15. Schools that are registered by April 15 will be entered in a lottery for free registration of a delegate at Convention (a 200 dollar value). Click on the image to learn more! 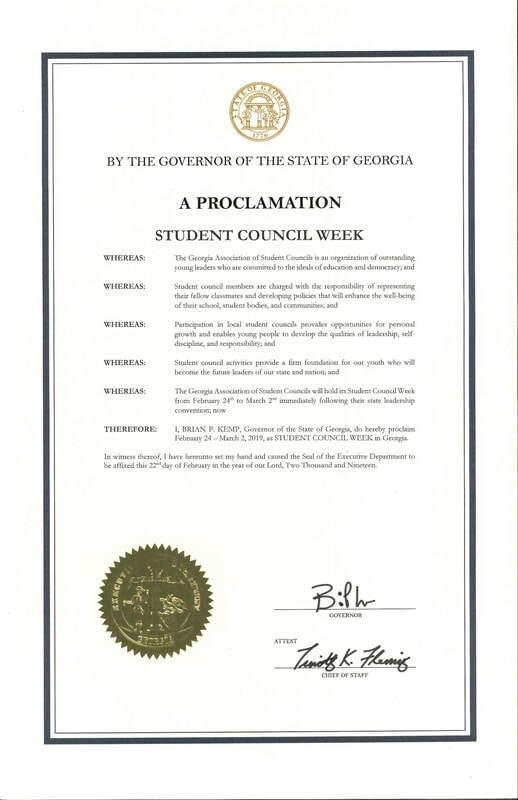 Governor declares February 24 to March 2 Student Council week! state convention, District Events, website, online links, and newsletters. Expand and sustain ​current membership. Uphold and promote the democratic ideals of GASC. ​national, and/or global service projects. Collaborate and build beneficial relationships with members and organizations who share GASC values. Recruit, support, and retain strong student council advisors. Congratulations to Meadowcreek High School and The Gwinnett School of Mathematics, Science, and Technology for being recognized as a gold level council of excellence by the National Student Council. Both schools meet a list of criteria to qualify for this prestigious national award. SIGN UP FOR OUR GAZETTE!